True to its name, this programme focuses on the States bordering the Great Lakes in North America and the heavy-duty tractor-trailer outfits that haul goods within them. As the material on this DVD was originally developed for VHS in 1993, the picture quality is sometimes slightly distorted in places; however, the content is so unique that it would have been a travesty not to reproduce it so that enthusiasts might enjoy an insight into trucking history. 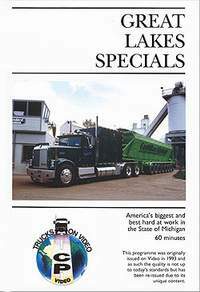 Features include: LTL B-Train 'break doubles' hauling steel for Detroit's car plants; Brockway 361 A-Train 'short doubles' moving aggregate in Michigan; eleven-axle truck-trailer combinations hauling 50-tonne payloads of pulpwood from forest to mill in Northern Michigan.